One of the rabbis I admire the most in the whole world is Rabbi Shlomo Aviner, so when I saw that there was a new movie made about him and his relationship with his daughter who is no longer religious, I was really curious to see it. And now, after having watched this video that I will definitely be pondering for a long time, I have newfound appreciation for Rabbi Aviner’s greatness. Having a daughter who doesn’t observe the mitzvot must be terribly painful for Rabbi Aviner and his wife, but he has not let what is quite likely the biggest disappointment of his life get in the way of their close, loving, and mutually-respectful relationship. I think this might be one of the clearest signs of true greatness. Accepting with love and making the best out of even the bitter pills that Hashem prescribes us in life. You couldn’t describe my thoughts about Rabbi Aviner any better than that. what is the code to watch the video please? I just posted a shorter version– looks like the full version is no longer available without the code…. I enjoyed the shorter version…but how does one find the code to the full length movie??? I don’t know, it used to be view-able without a code. Yet that is not true. The essence of a Jew is not measured by behavioral criteria, nor does it depend on Mitzvah fulfillment. A Jew, even if he be secular, is still a Jew. One’s very Jewishness is independent of one’s deeds. It should be borne out by one’s deeds, but it does not depend on them. It is an inner quality and a spiritual character. We are plagued by a very deep crisis of loss of, and search for, identity, and this is bitterly painful for us. In these times, we cannot avoid this issue. We must remember what we are, what our lives are, what it means for us to be a special nation, distinct from all others. We constitute a unique component of mankind, a people with a unique national psyche. We belong to a people that was not born recently, but in ancient times: the people of eternity, Eternal Israel. The film was very moving. Even though there were subtitles I was a bit confused since there seems to be two or is it three daughters of rabbis portrayed? Having a daughter who is also at this point not practicing her Yiddishkeit makes this even more poignant for me but I object to this quote, “quite likely the biggest disappointment of his life” since I would not want anyone to think that my daughter is a ‘disappointment’. His daughter (and mine as well) are talented and expressive and is still exploring the role of Hakodosh Boruch Hu in their life. Painful, yes, but he (and I)still have a lot to be proud of and stay connected to which is the only way for her to want to ever ‘return’. There comes a point when in order to truly connect the daughter has to feel that she is accepted as she is and doesn’t have to fake compliance with halacha in the presence of family. This is very tricky since we are sensitive to other family members and don’t want to have a negative impact on them. People assure me that she will return but no matter what she will always be my daughter. Why would following halacha be “faking”? First, if *you* believe that halacha is what G-d wants us to do, whether *she* believes or not doesn’t change the fact that, when following halacha in the presence of your family, this is what G-d wants her to do. Second, people “fake compliance” when they remove their shoes when entering a Japanese home or follow whatever practices others do, out of respect. Acting respectfully is just that, not faking. I found it so interesting and sad that the men in the video have greater respect for the rabbis than the daughters. thanks for sharing this hadassah…. Just another insight from an article on the Chabad.org website related to this topic. It is great to read the article in its entirety but this point was the most relevant. “The difference between Moses and his predecessors is also reflected in the extent of their influence on their fellows. Enoch, with his wholly self-directed righteousness, had no influence, and was himself susceptible to influence. Noah — who extended himself to his fellows, but only because he recognized that concern for one’s fellow is an integral part of a perfect self — was not influenceable, but did not influence. Abraham’s teaching and instruction, free of such personal bias, was embraced by multitudes of followers; but since even Abraham’s efforts fell short of the pure definition of selflessness, his influence was correspondingly limited. Today, we have no traceable heirs to Abraham’s disciples (what, indeed, ever became of the “souls they had made in Charan”?). But the effects of Moses’ utterly selfless love are eternal: his guidance and leadership of his people yielded a nation whose endurance and unbroken continuity, to this very day, defies all laws of history. In order to truly influence a fellow, we must devote ourselves to him or her without regard to whether s/he will be influenced or not. He is a fellow human being who needs your help. So help him. If she lacks something material, help her. If she is spiritually lost, help her. Many see the point of influencing a fellow Jew to do a good deed, a mitzvah — to put on tefillin, to perform a single act of charity, to avoid a moral transgression — if this leads to a greater involvement, and ultimately, a complete transformation. But when confronted with a “lost case” they feel it’s a waste of time. Why bother? I would like to know who the author of this very important article was, Hadassah, so that I can look it up and read the whole thing. Very very insightful! i think these girls seem completely lost; they are looking for a kind of freedom they didn’t find in their home; maybe something was missing in their relationship to their parents or to themselves? what do you think hey jewishmoms??? i think this movie scaring for our daughters future; what should we do for our girls, or is it the will of Hashem and a kind of test for the parents and we can’t prevent it??? by the way i think that those girls are very young, they are looking for themselves actually maybe they will come back to religion with more emuna and dvekus! This was indeed very moving for me. The father-daughter relationships portrayed are all very different. 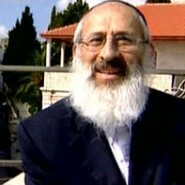 Rav Aviner’s love for his daughter is clearly evident. But it’s more than that. He is at peace with himself, and is making the effort to have a relationship with his daughter on her terms. He is keeping the bond strong, and the love is flowing. In Az Yashir we say: This is my G-d and I will praise him (v’anveihu), the G-d of my fathers and I will exalt him”. When one develops his own personal relationship with Hashem Yisborach, then “anveihu= ani v’hu, I am intertwined with Him; but if I only rely on the relationship my father has with Him, the ‘aromemenu’ I perceive Him as high and distant. As parents we have to help our children develop their own personal relationship with G-d.